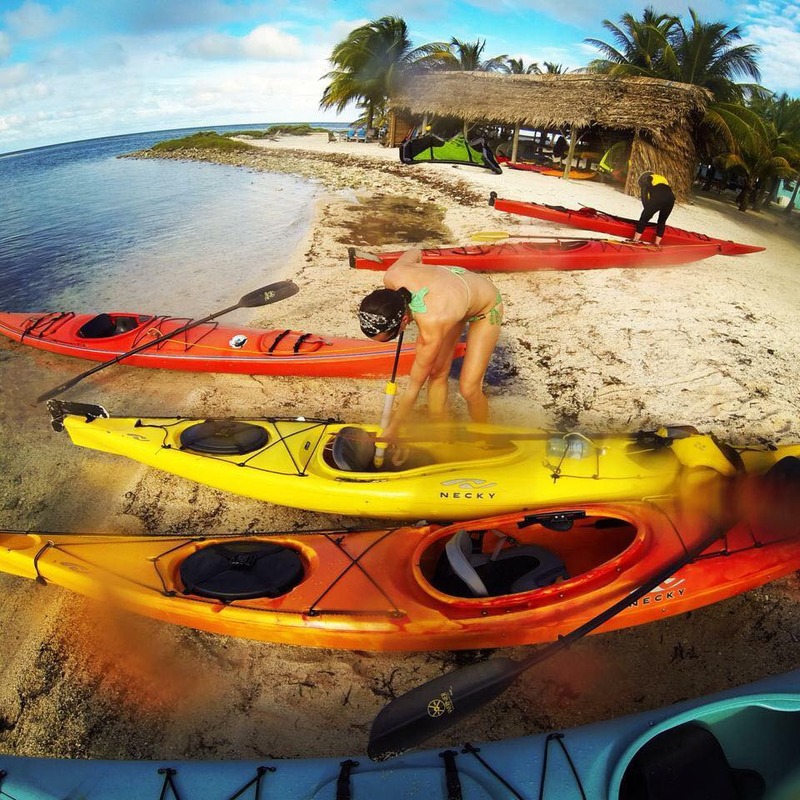 Experience the #1 outdoor adventure travel package in Belize – This is not just a kitesurf vacation or a Mayan ruin tour, you can experience 15 sport activities on this 8 night package! You will stay at four different places during this exciting adventure, including 3 nights at our Long Caye Resort. Our Belize Adventure Week travel package always begins on Saturday. We meet late in the day on Day 1; you are responsible for getting yourself to Dangriga, a 15-minute flight from Belize City. We do recommend you fly in a full day early (so as to insure inadvertent delays don’t cause you to miss the first morning of your trip.) For more explanation on this option see Our Hints for a Better Vacation. 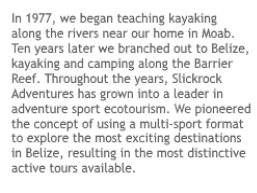 Although this is an accurate description of the Belize Adventure Week package, it can be subject to change. 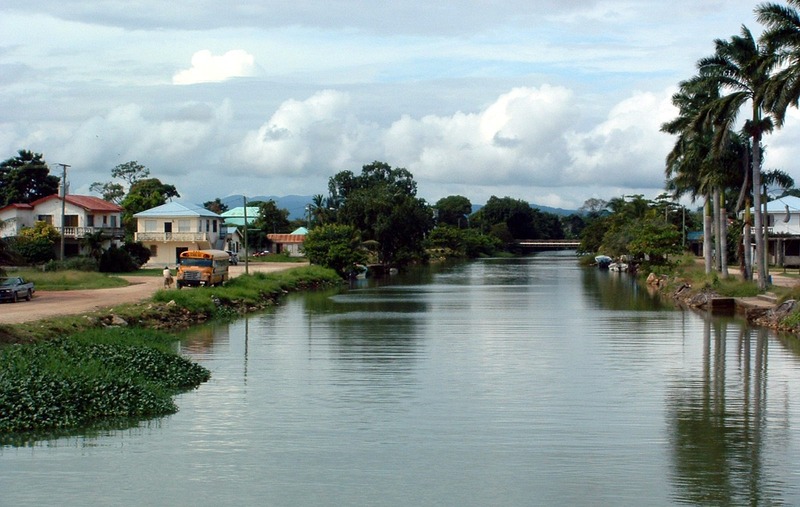 Belize weather, river levels, wind speed, and road conditions can cause delays and substitution of activities. The exact day-by-day activity schedule may vary a little from week to week. We have a free printable map of Belize that will help you to better visualize all of the terrain we cover in one week. Fly into BZE, then continue on a local flight to Dangriga (guest responsibility, see Belize Domestic Flights). We meet for orientation, dinner, and overnight at Pelican Beach Resort at 6:00 p.m. We cover all hotels, meals, and transport once meeting you. Our guide will wait for everyone before starting the orientation, and attendance this evening is required. After a sunrise awakening we drive to Bocawina Rainforest Resort (45 min) for breakfast, then prepare for the waterfall rappel. 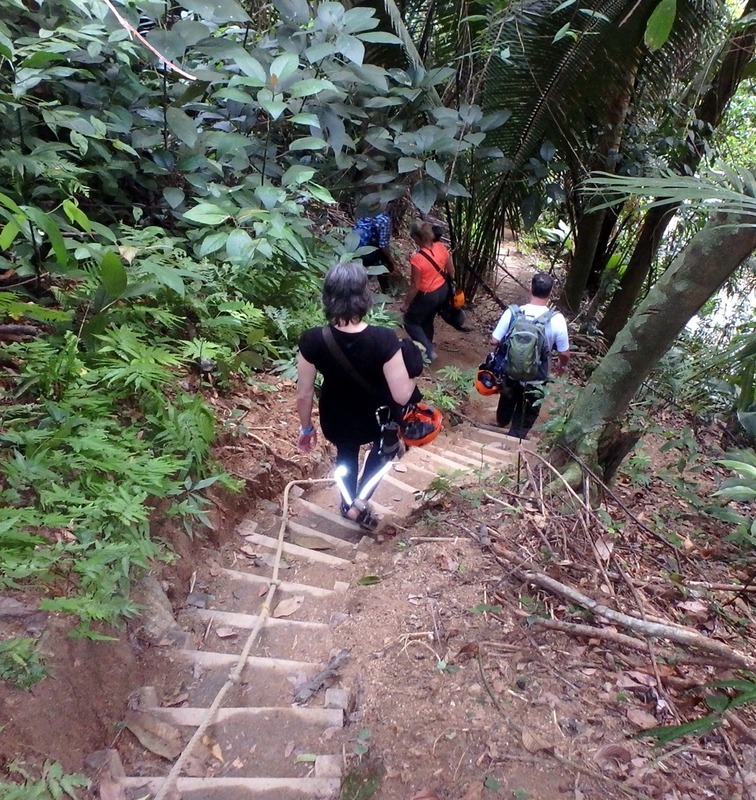 The hike is about 600’ up a steep jungle trail, where a view to the sea and refreshing pool reward our effort. 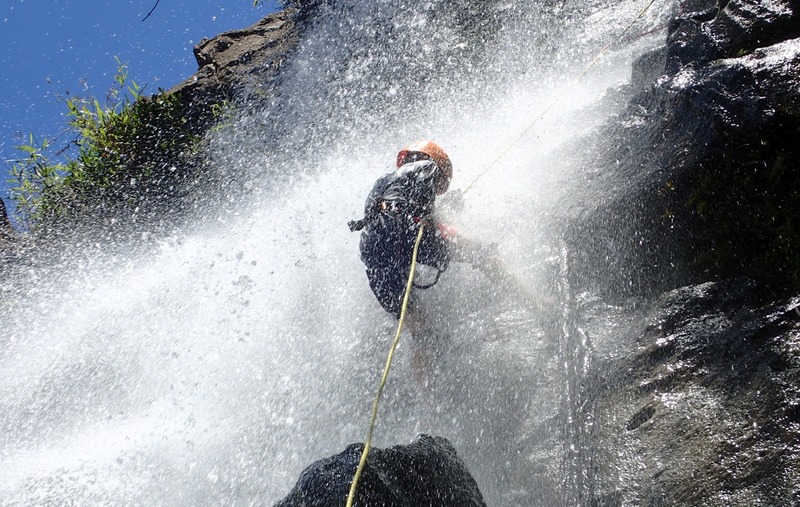 The guides train everyone on rappelling, and one by one each person descends through the waterfalls. Guests can hike back down to opt out of this event if they choose, the pool is definitely worth the hike. This is a thrilling morning! After lunch we go zip-lining! Bocawina guides set everyone up with harnesses and give thorough instruction on the zip-line technique. Any guests feeling uncertain of their ability can ride tandem with a guide. This is the longest zip-line in Central America, the longest run of the seven stages is 2300 feet! In the early afternoon we drive the sylvan Hummingbird Highway to our next destination, Cassia Hill Resort near San Ignacio (2 hrs). The drive takes us past citrus orchards and villages and miles of jungle; you get a good feel for inland Belize on this lovely drive. Passing through the regional center of San Ignacio, we check into our lodging at Cassia Hill on the outskirts of town. We stay here for the next two nights. For more information on Cassia Hill, visit Things to Do in Belize. 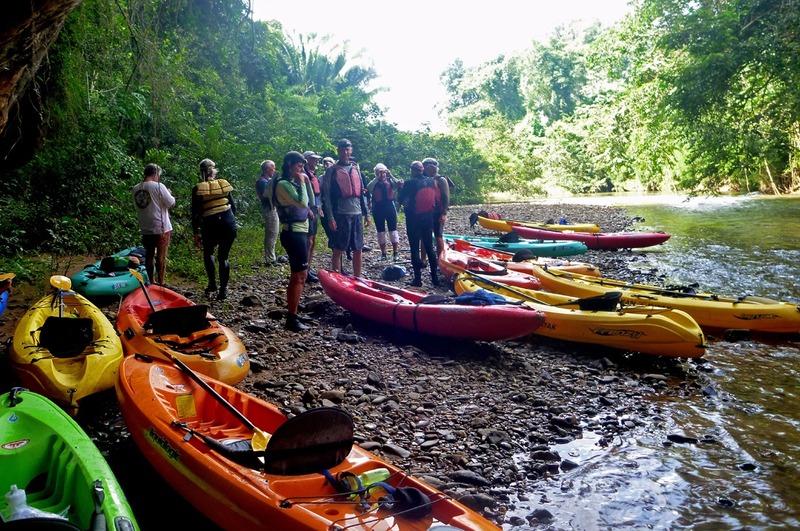 After breakfast we embark on a kayak run down the Mopan River. 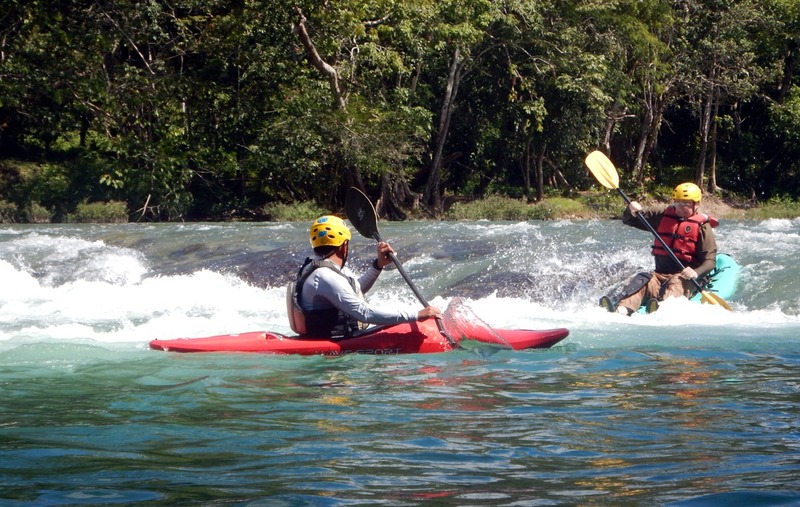 We use sit-on-top kayaks for this adventure, which are stable and easy to paddle. A land training session is followed with further instruction as we travel downstream. The beginner-level rapids are quite exciting! You will learn to surf waves, dodge rocks, and plunge off small drops. We enjoy lunch at a riverside cafe. 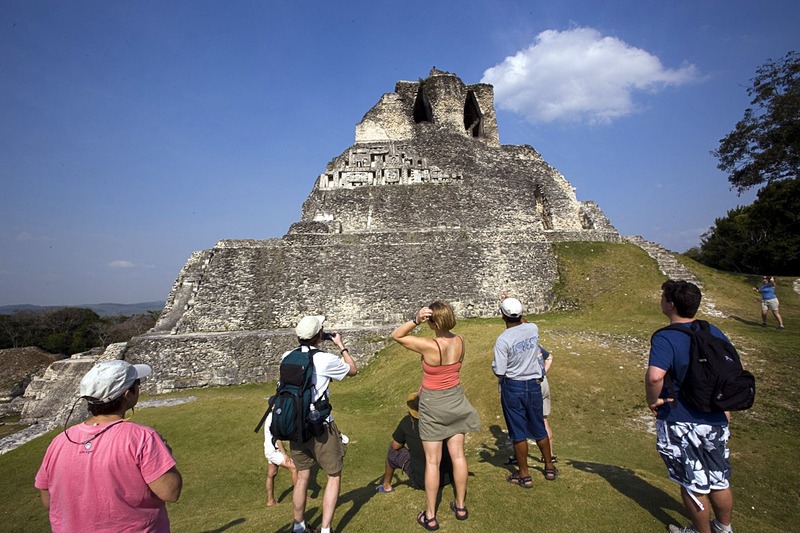 In the afternoon we climb The Castillo pyramid at Xunantunich Ruins, where our guide (a Mayan himself) interprets the ruins and Mayan culture. We return to Cassia Hill for the night. We pack up early and drive to the Caves Branch River Belize. 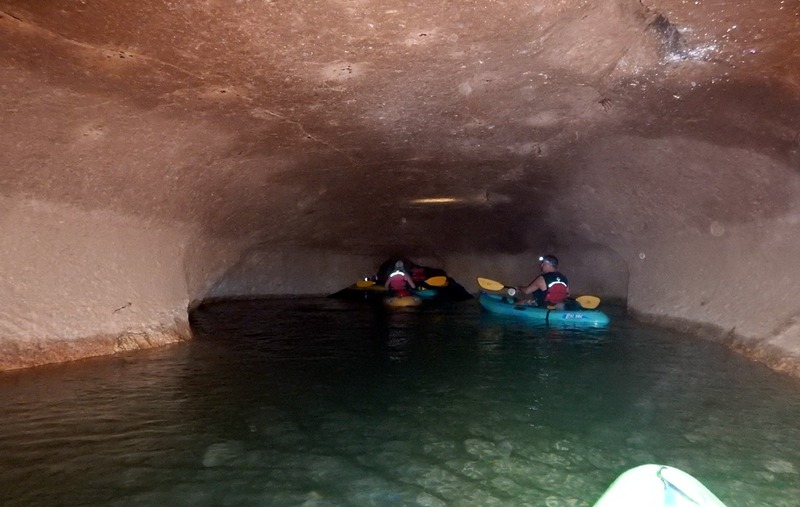 After a short orientation we launch on our underground journey in hardshell kayaks, navigating by headlamp. This unique trip combines caving with river running. Everyone must negotiate a quarter-mile portage on a jungle trail during this five-mile run. This is arguably the best one-day adventure in the country! In the late afternoon we drive to the Belize Biltmore Plaza hotel in Belize City where we are joined by others on the Adventure Island at Glover’s Reef Second Half package. After checking into the Biltmore, we meet to go over instructions for the island, followed by dinner and overnight at the hotel. After breakfast at the hotel we walk two blocks to our dock (luggage is driven). The boat leaves around 8 or 9 a.m., arriving at the island just before lunch. 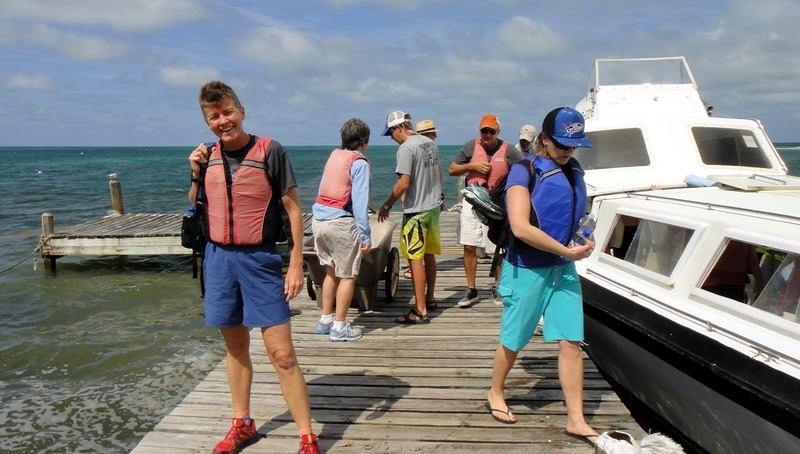 It takes 3 – 3.5 hours to get to Long Caye (65 miles), crossing the Belize Barrier Reef just south of Tobacco Caye. For more about our Glovers transport, please see this page. Once on the island we begin with an complete tour of our facility. Lunch is waiting for us, and afterwards you settle into your very own Belize cabana on the water. By 1:30 or 2:00 we are meeting for our first sport orientation: snorkeling! Everyone participates in this session, as well as the sea kayak orientation the next morning. These sessions are only offered once. 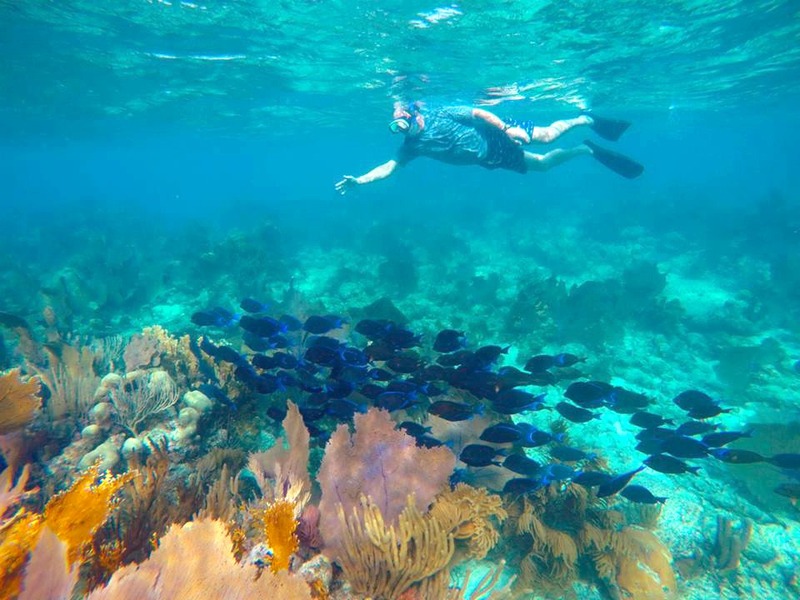 We start with a review of your gear and snorkel safety specific to our area (guests are responsible for providing their own snorkel gear, for our recommendations see our Belize packing list. We then break into smaller groups, each with their own guide, and swim to our closest snorkel spot for your first snorkel at Glover’s Reef. From now on everyone can snorkel as much as they like, as long as you run your snorkel plan by us and have a buddy to join you. Group snorkel excursions are scheduled throughout the week, usually daily. 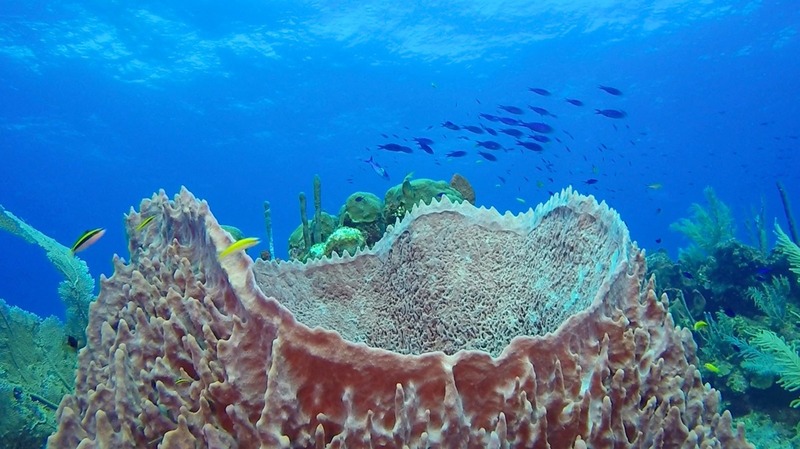 Visit our Belize snorkeling page for more underwater images and a list of creatures we often see. We also have a map of sites for Belize snorkeling from shore which will show you how many snorkeling options we have close to the island. Related Blog Post: Snorkeling is even stupendous right under our dock! This morning we conduct the sea kayak orientation, which starts off on the beach, followed by a practice session in the water. We cover paddle strokes, entering and exiting the kayak (so you can snorkel out of the kayaks), and rescue techniques so that you are safe to paddle with or without a guide, as long as you have a buddy. After lunch, one guide takes a group paddling to a nearby patch reef to practice what we just learned, while another guide offers windsurfing instruction. Certified divers may also begin diving this afternoon, and fishermen can fish anytime. 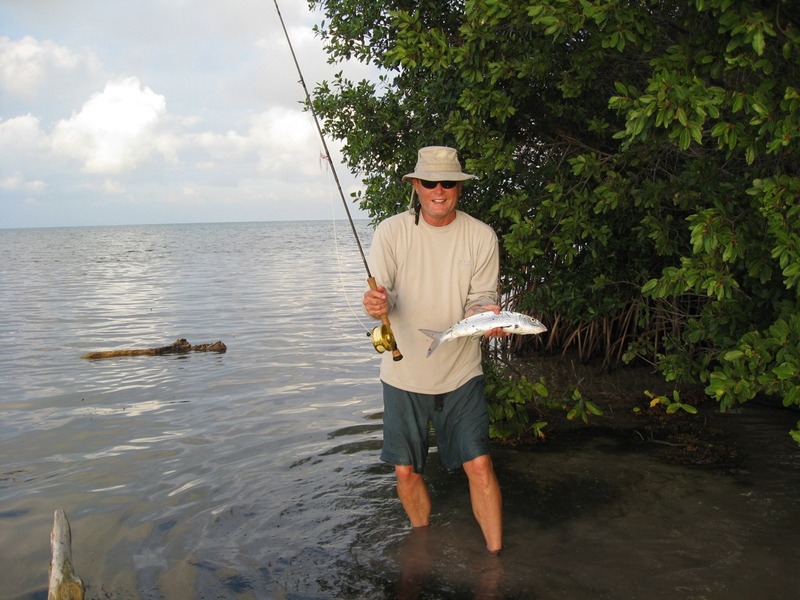 In fact, we pay for your Belize fishing license so you can begin fishing right away. Our final full day is always the best. Get in more diving, snorkeling, or kayaking. Our Belizean cooks prepare fantastic feasts for us, which we enjoy in between this wide array of activities. Visit our Belize cuisine page. 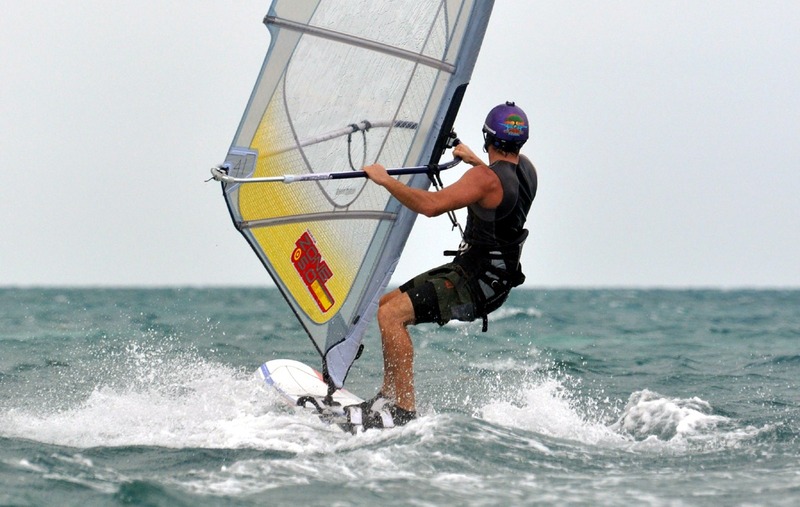 Other options not yet mentioned include windsurfing, kayak rolling, paddleboarding, kitesurfing, kayak surfing, a downwind paddleboard trip to Southwest Caye 6 miles away, night snorkeling, full-moon paddling, and learning kiteboarding basics using our trainer kite. And did you know we have the only Belize surfing center in the country? After an early morning paddleboard session before breakfast, we snorkel to “Lobster Rocks”, a nearby, shallow patch reef. Fishermen can fish right up until the boat comes. 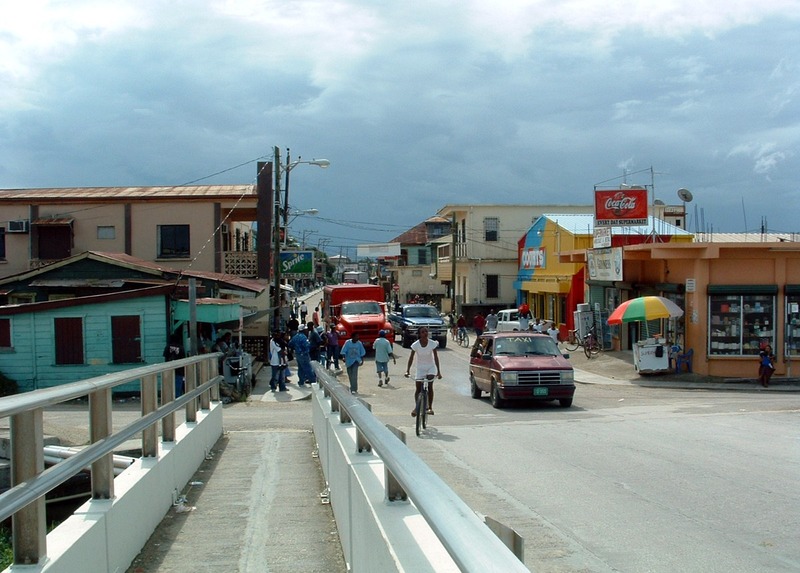 After lunch we return to Belize City.